First up is my free mini Sephora haul. Just went there to redeem my beauty points! I feel so proud of myself for not spending any money in Sephora. I always end up buying new toners or blushes whenever I go to Sephora. 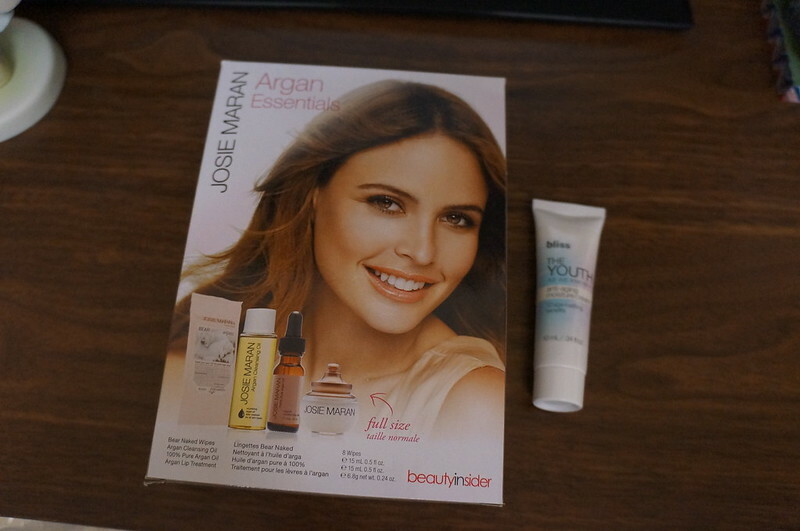 Ever since I heard about the Josie Maran Argan Essentials beauty insider rewards, I've been trying to get it. I just couldn't find it at any Sephora stores I went to. For the longest time all the rewards they had didn't appeal to me. I have over 1,500 points sitting in the beauty account with nothing to redeem. The last time I redeemed my points was for the Philosophy skincare set which was at least 2 years ago. 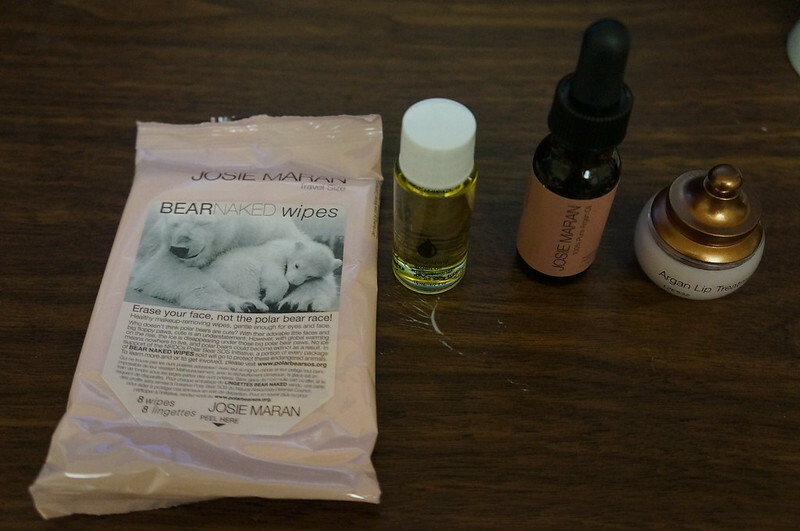 I've always wanted to try Josie Maran products so I wanted this set badly. I've been to the Sephora at Eaton Centre, Bloor Street, Fairview and Yorkdale, they were always out of this set or their stores haven't received it when I went. I never expected I would be able to find this reward in store. I thought of ordering the SK-II mask in lotion so that I can redeem my beauty points. There are four products in this beauty reward. The sizes of the products are quite generous when it comes to the 500 points rewards. I still remember the 100 points rewards used to be so tiny that I wasn't interested in redeeming at all. There is facial wipes, cleansing oil, Pure argan oil and lip treatment in the beauty reward with the lip treatment being a full size product. 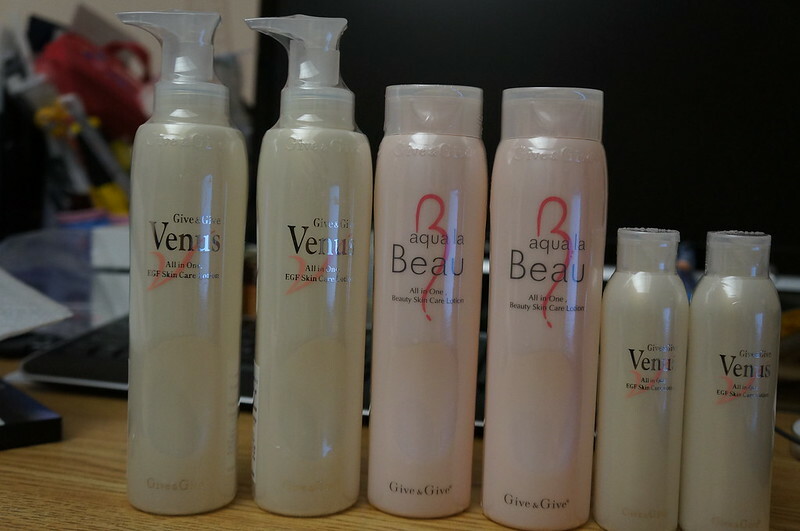 I haven't tried any of the products yet but I will try them soon. I will probably try the Bear Naked wipes first. I love face wipes. I use them on my lazy days which is at least once a week. I use japanese cleansing oils when I remove my make up but I would love to see if the argan cleansing oil is better. Pure argan oil that could be used as a daily moisturizer. I've never tried using oil on my face as a moisturizer as I don't have dry skin and I'm afraid of having break outs but I will try to see if I like it. Lip treatment, I do like it as it's a full size product and I like the scent of the lip treatment but I hate lip products that come in a jar. I don't dab my finger in my lip balm or any other products, I always use a brush or a spatula. I will have to use a lip brush which means this won't be a product I carry around with me. I also used my points to redeem a Bliss the youth as we know anti aging cream. it's a deluxe sample with 10ml. I love products from Bliss. I love their mask so I would love to try their face cream. The cream I'm currently using had been discontinued so I'm searching for a face cream. I received two packages in the mail today and they are things I've always wanted to try. Give & Give skin care serums. Will these two products become my holy grail skin care products? I've first heard of Give & Give about half a year ago. It's a product from Japan and I went to Japan last year but couldn't find it at all in Sapporo. It was available in two other cities in Hokkaido but not Sapporo. From their Japanese site, they don't ship outside of Japan so I had to get these products through their Taiwanese dealer. They are both all in one beauty skin care serum. You can use it to wash your face, not for removing your make up, more for using as the last step of cleansing. You can also use it for massaging your face, use it as a toner and a serum. For the venus serum you can also use it as a facial mask. The main ingredients in the serum include EGF, hyaluronic acid and collegen. Both contains EGF, it's just that the pink bottle has a higher EGF content level. There are two other serums from this company. I will try them if I like these two serum. From the guides they sent me, I'm supposed to use it to wash my face in the morning to remove the dirt and oil on my skin. And it's supposed to make your skin feel soft, smooth and healthy glow. Yes, they suggest you using serum to wash your face. I've never thought of using serum to wash my face. But I will give it a try. The next item I received in the mail is the Iony cream booster. It works like the Talika cream booster but it's 1/3 the price. 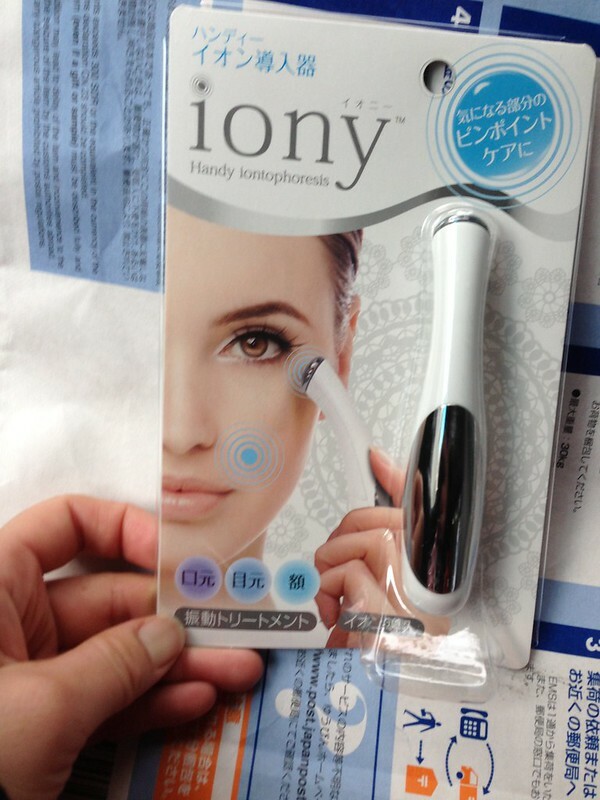 This is an ionotheraphy device that uses micro current to deliver the active ingredients into your skin. It makes it faster for your skin to absorb the cream. It also vibrates at a rate of 8000/min that helps improve blood circulation. There is also another function- to test out which part of your body is dry. There are no switches on the Iony. You hold onto the metal part and once you put it on your skin, the device turns on automatically. However, if your skin is too dry, it doesn't turn on. I used it to test out the moisture level on my skin. My face and neck both passed the test without problem. But my body didn't pass the test and I think it's because I never have the habit of using body cream on a regular basis. I only use body cream when my skin is very dry. I guess its telling me I need to start using body cream on a daily basis now!